An Indian-origin couple has been harassed in Canada by a 'racist' white man who yelled that 'go back to your country' and threatened to 'kill' their children, prompting police to investigate it as a hate crime, according to media reports. The incident happened on Sunday when the Indian and the 47-year-old Dale Robertson got into a scuffle over a parking lot at the Walmart Supercentre in Hamilton, Ontario. •He threatens to kill the children of the indian couple#WhereWasHeRadicalized? 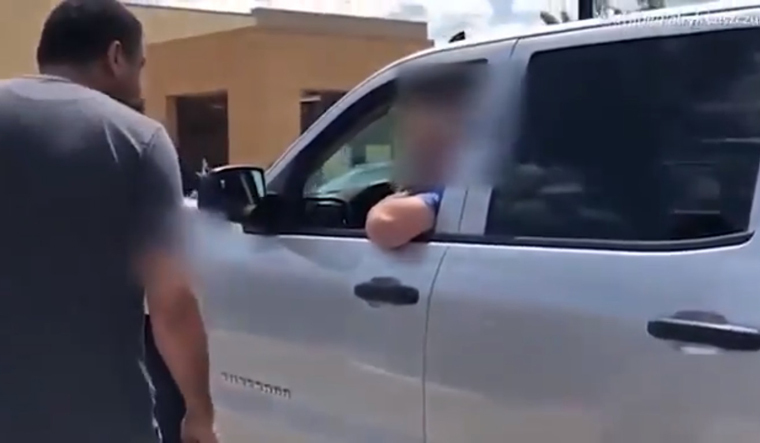 The argument started after the couple, who were not identified, tried to back into a parking spot and apparently got in the way of the Robertson, who then gets into his silver truck as the Indian man tries to talk to him, CBC reported. "What kind of example are you setting for your children?" the Indian man is heard asking the other as his wife records, the video of which is uploaded on YouTube and Facebook. Within a matter of moments the heated argument escalates and the Indian man's wife appears to get hit by the truck as Robertson quickly accelerates before hitting the brakes, the report said. The Indian man walks alongside the truck as it slowly drives away and says, "You want me to go to my own country? I'm a Canadian citizen." Robertson responds by saying "Show me. Prove it. I don't believe you." Then, he crudely attempts to copy the other man's accent saying "You don't talk like a Canadian." The couple are originally from India, but are Canadian citizens who have been living in Canada for the past seven or eight years, it said. Hamilton police are investigating the incident as a hate crime, the report added. The man and woman who were targeted were traumatised by what happened, Detective Paul Corrigan said. "It hit them really hard," he said. "They were extremely shocked by it, they had not experienced (something like this) before." Meanwhile, Robertson has been arrested and also charged with with threatening death, dangerous driving and failing to remain at the scene of an accident, it added. Hamilton has the the second-highest rate of police-reported hate crimes in the country, according to Corrigan. So far, 58 hate or bias incidents have been recorded this year about equal to the number reported by this point in 2017 so Corrigan said rate of reports seems to be plateauing.